I know and like G., of course, and I knew that he was getting married soon, but I have never met his fiance, so I assumed that this email got to me by mistake. After taking a moment to snicker at the phrase "hen-party" ('What is this, 1962?' I thought to myself), I banished the email to the trash can and didn't think about it again. Until Friday, that is, when suddenly the other recipients of the email (all the female members of my department and the girlfriend of another) started thinking that this was very odd, and maybe there was a reason that so many female friends of G. had been invited to this party... "Maybe she doesn't have any friends and we are needed to create a party atmosphere," was a common sentiment. It was mentioned that G.'s buddies were throwing him a real blow-out of a bachelor party even as we spoke; they had a full day of games including laser tag, mini-golf, bowling (and they went to an atmospheric restaurant in a cellar somewhere and got completely drunk). At the end of the day, grad student P. (who had also never met A., but at least is Swedish) was drafted to call one of the people, with the instructions to make sure that we we were actually wanted at this party, and not just invited by mistake. Through what appears in retrospect appears to be a series of misunderstandings, we decided to meet at at 11:30 to all walk in together. Grad student Z. (who has met A. twice) and I had to leave at about 10:30 to get there in time, and so did C., post doc E.'s girlfriend, who lives a 20-minute drive out of town (and who has also never met A.). Meanwhile, P. called the party to confirm that we should be there at 11:30... only to be told that they had all gone out to lunch, and could we come at 13:30 instead? Well, this was a little awkward... it was now 11:10, and C. was already in town to pick up Z. and me from downtown, and now we had two and a half hours on our hands. C. offered to take us to her house, and so that's what we did, stopping at a large shopping center on the way to buy some freezer pizzas and cider for lunch. C. and E. live out in the country, in a village with the charming name of Tibble. Tibble is approximately the size of Derby, Michigan (but it does have an old stave church from the 1200s and its own runestone), and to get there you drive through some lovely farmland, and some rocky areas that are more suited to ranching. 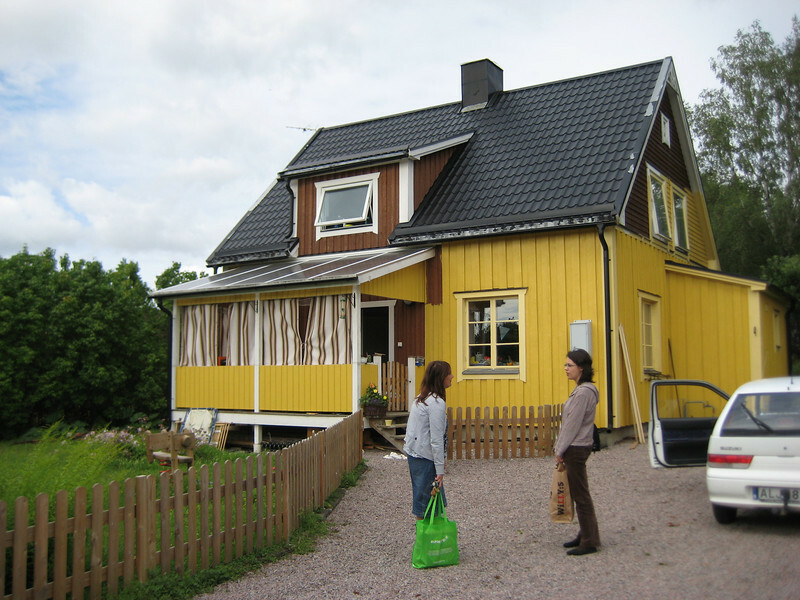 C. and E. have a very nice small house that was built at 1932, on maybe four acres, complete with a barn and hallon and röd vinbär bushes, smultron plants, and an äpple tree. It was very nice to drive out in the countryside, and I was surprised at how pleasant it was to be in a house with a family for a little while. I guess I've been missing that! It was amusing to hear their son Sven, who is three, speaking to us in a pidgin of Dutch and Swedish. So after lunch and a tour of the property, we headed back into town. 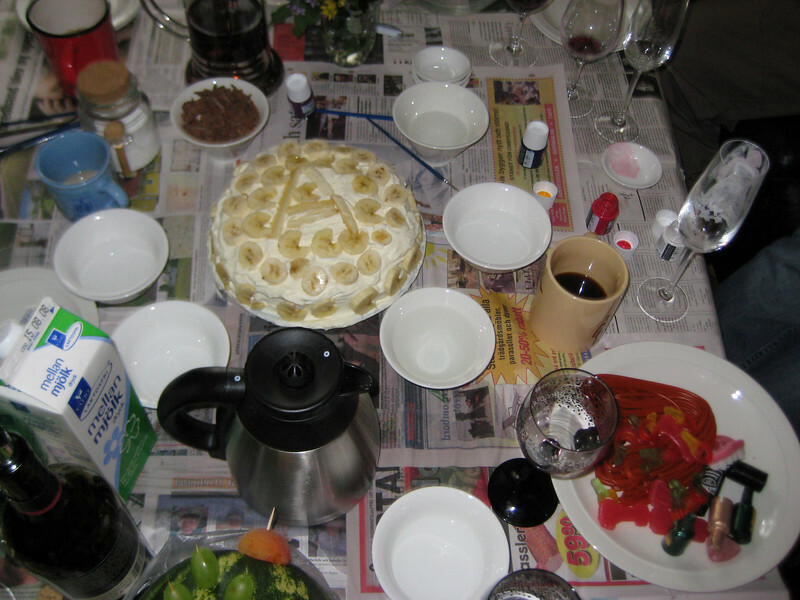 The möhippa started with a chocolate tasting, with red wine to clear the palate, and this was not the informal affair I had expected. Our hostess had been to a fancy tasting once, and had bought a chocolate-tasting kit with thin disks of chocolate (high-cocoa-low-sugar content, single-origin beans) from around the world. We were given a double sided piece of paper for evaluating the chocolate on utseende, doft, brytbarhet, konsistens, smak, and finally, to give it an omdöme. On the reverse side, there was a list of suggested adjectives to choose from, including words like "spansk skinka" and ""sjungande" and "skogsdoft" (just to list a couple that I understand). And here, finally, is where we run into some cultural differences: I coudn't tell how seriously they were taking this. I have some foodie friends (you know who you are), and I can easily imagine that we'd have a chocolate tasting. I can even imagine that the words "Hmm, tastes a little smoky" or "This one is more creamy and sweeter than the others" might pass our lips un-ironically. But I think that phrases like "It smells more interesting than it tastes" might start to make our lips twitch at the corners, and things like "It has just a hint of nuttiness, almost as if you expect to hit a nut at any moment" and "The sound it makes when you break the disk is reminiscent of ice breaking in spring after a long hard winter" might have us giving each other sidelong glances and sniggering, before breaking into open laughter. Let me make it clear that it is not the solemnity of the occasion that I am questioning here; rather, I am merely reporting my inability to properly read the other people, who were without a hint of self-mockery. I pitched in along with the rest. The Madagascar chocolate was the best one, we all agreed. What did it taste like? "Coffee and wine with a sour aftertaste." The sound of it breaking? Not singing like ice, but "Sounds solid, like a car door slamming." But it wasn't over yet. The next group activity was to paint a punch bowl for the couple, while the bride-to-be painted two champagne glasses, one for her and one for the groom. It was decided that we should have a theme inspired from the party, so a chocolate pod was painted on the bottom, while the rest of us painted an outline of one of the countries from which we had chocolate. Venezuela is hard to draw, as is "St. Dominigue." So a fun afternoon was had by all. We parted on very good terms, and it turns out that we are in fact invited to the wedding on August 30 (we weren't sure if we were, but G. printed up their invitations this afternoon). So what's my final word on a svensk möhippa? I still have the feeling that this one was a little non-traditional, but I bet that too much wine, too much chocolate, and lots of coffee are common to all of them. Why mess with a good thing? Okay, äpple tree is what we think, but apelsinjuice is confusing. I watch the olympics on CBC because I get better rabbit ear reception for it. Yesterday, the announcer suggested that we skip work to watch the Sweden vs. Canada women's soccer match. That game had a winner. I'd already seen Canada vs. China, which ended in a 1:1 tie. Games with typically low integer scores are prone to ties. Too many ties may make it hard to determine advancement to finals. I've observed players stumble gracelessly while attempting to kick and run at the same time. I also saw a woman fall down and somersault backwards, after being hit by the ball. To reduce both problems with one minor rule change, my husband proposes fractional style points. Imagine the announcer saying "oh, that was an awkward landing, she'll lose 3/10 of a point for that one." A friend suggests expanding it to cover players showing extreme agony over a minor injury, like a stubbed toe that requires a stretcher. By the way, I'm seeing a broken lock (for https) on your comments page. Sweden-Canada was a great game. It helped that both teams knew they were almost certainly going to the quarterfinals, so play was open and end-to-end. Sorry I couldn't see it on CBC. Well, Canada-USA is next on Friday, I'm sure they'll have plenty to say about that one. I like the suggestion to award or detract points for awkward landings or just looking foolish... surprisingly, so far in this tournament, Germany might be beating Brazil in the "bad acting" category! "Äpelsin" is confusing. So is "ananas."